Amazon’s Echo lineup has made a solid name for itself in the smart speaker space, but it has been known for average, but not premium sound. The Echo Sub, a companion subwoofer that pairs with some Echo speakers, is Amazon’s first serious attempt at breaking that mold. The Echo Sub offers some serious firepower for its size – a down-firing 15cm woofer and 100W of Class D amplification – and the only controls you get are the power and pairing but­tons, with the Sub relinquishing all other control to the paired Echo speaker. The squat, cylindrical Sub echoes the design of the latest generation of Echos with its dark mesh fabric and rounded top and isn’t designed to blend in to a corner or under a TV like a soundbar. As with all subwoofers, it needs adequate floor space to work effectively, which is something buyers with cramped interiors should keep in mind. Pairing is easy with the Al­exa app, but it is limited only to the Echo/Echo Plus or the latest Echo Dot, so you can­not use it with say the Fire TV stick and your TV for movie playback. The bass that the Sub adds to Echo Plus’ output is impressive, oftentimes adding a whole new dimension and some much-needed volume to the Echo audio experience. 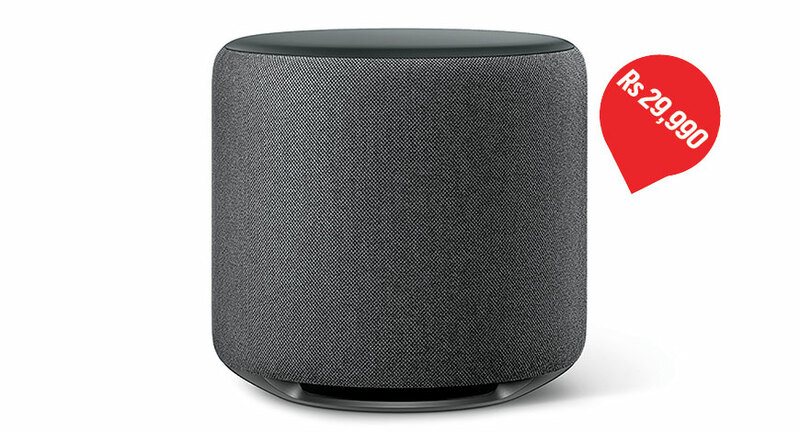 There were songs where the bass overpowered the vocals or the instru­ments, and it is then that you wish Amazon’s Echo speak­ers were more up to the task of taking on the mighty Sub! At other times, the Sub’s high volume blocked the Echo from picking up my “Alexa” commands, and one had to shout over the Sub to make oneself heard! As a companion for an existing Echo setup, the Sub adds a lot of oomph to the music but it is not out-and-out audiophile quality…and that’s fine, since you are not re­ally expecting that level of audio quality with something that’s pairing with an Amazon Echo device anyway. For most regular folks who listen to music simply out of the convenience of asking Alexa to play something, the Echo Sub is a serious level up, and the ease with which it inte­grates into your setup is an added bonus.